“As pioneers of this new world, it’s our duty to resist and fight those who attempt to stop us. Whether you’re a journalist or blogger, or a participant of Anonymous, or the activists on the ground who protest against these corporate thugs and oppressive regimes and risk everything for freedom of information and speech, we are all in this battle together and we have a responsibility to protect our civil liberties. “This attack tomorrow will send yet another message to the pigs that run the state that we will not be another cog in the f****d up clock that these corporate entities attempt to preserve through their political puppets in Washington. The PROTECT IP bill, a reiteration of the failed COICA bill, would give the US Justice Department broad powers to shut down access to websites it deems “dedicated to infringing activities.” As Anonymous accurately describes, these powers include forcing ISPs to block access to targeted websites, and even requiring search engines, like Google and Bing, to completely remove the websites from their search indexes. Perhaps even more troubling, the bill would also give private citizens — i.e. copyright holders — the ability to request that the government block a websites’ ability to display advertising, or process payments. Anonymous says that, rather than reduce piracy, the bill simply “endangers the free flow of information,” through the use of “domain seizures, ISP blockades, search engine censorship, and the restriction of funding to accused websites,” says Anonymous. All of this, they say, “takes Internet censorship to the next level.” The hacker’s interpretation of the bill, a summary of which leaked online last week, is echoed by a variety of other privacy advocates, who say the legislation is woefully misguided, and will result in rampant government censorship. “Protecting copyright and trademark are of course important objectives,” writes author and technology expert Larry Downes in an analysis of the bill posted to CNet. “But doing so by trampling due process rights, tinkering dangerously with the mechanics of the Internet, and impressing into police duties an expanding set of Internet service providers, hardly seems the best solution.” Anonymous first came into the world spotlight after launching a series of similar attacks on the corporate websites of PayPal, Master Card and Visa, all of which stopped processing donation payments made to whistle blowing website WikiLeaks. Most recently, members of the group were accused by Sony of initiating (or, at least, facilitating) an attack on its PlayStation Network, which resulted in the theft of nearly 13 million user credit cards, and could cost the company upwards of $170 million in damages. 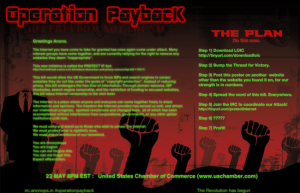 Those who wish to join in the DDoS attack — which simply overloads a website’s servers with an overwhelming amount of traffic, causing it to go offline — can join other Anons in the #OperationPayback IRC channel, where countless supporters have gathered to coordinate the attack.